Syracuse Fashion Week is a semi-annual celebration of style and fashion in Syracuse and Central New York. This weekend of fashion and fun brings together designers, boutiques, stylists, artists, musicians, bars, restaurants, and other businesses that have a vested interest in the quality of life in upstate New York. While clothing is celebrated as one of the essentials to a happy human existence, another vitally important essential is food. Hunger and food insecurity is, unfortunately, an ever-growing concern in many areas of the country, including the Syracuse area. For this reason, Syracuse Fashion Week also partners with Food Bank of Central New York to raise awareness and funds for this social issue. 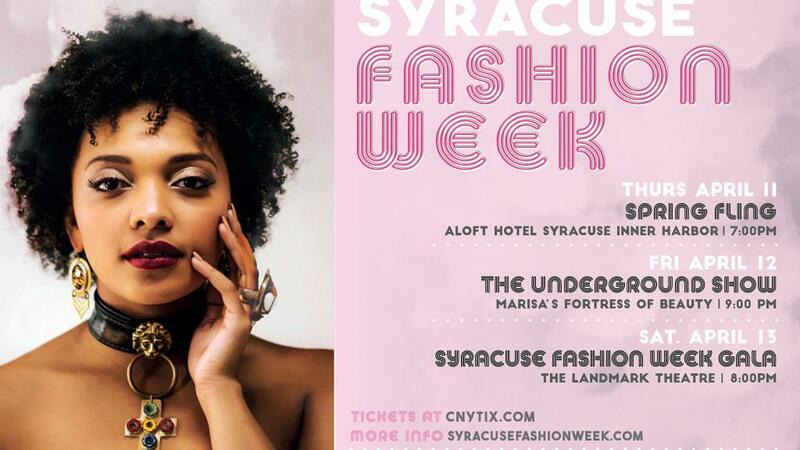 This year, Syracuse Fashion Week will take place April 11th-13th. On Thursday, April 11th the Aloft Syracuse Inner Harbor will be hosting the Spring Fling show at 7:00 pm with a “buy local” theme featuring local designers and boutiques. The Inner Harbor hotel lobby is the perfect mix of vibrant and modern for a spring style runway. Get a firsthand look at custom designed swimwear, accessories and both business and casual looks. On Friday, April 12th at 9:00 pm, the Underground show which is a runway fashion show featuring lingerie, clubwear, accessories and jewelry from various decades will be held at Marisa’s Fortress of Beauty. Lastly, on April 13th at 8:00 pm, will be the Gala show at the Syracuse Landmark Theatre featuring formal dresses, bridal gowns, and men’s wear. Buy your tickets today to get an exclusive look at Syracuse style. Go For Broke Clothing Co.